Fujifilm has announced a 100 megapixel version of its GFX medium format camera that will go on sale next year. It will be the first medium format camera with built-in image stabilisation. At the launch at Photokina 2018, they explain that the sensor that it is so sensitive that it really needed stabilisation. The image stabilisation should make it much more feasible to capture ultra-high resolution images while using the camera handheld. To this end, Fujifilm has also added an integrated vertical handgrip – a first for the GFX series. 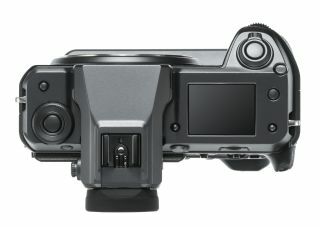 The stabilisation system is one of three ‘world’s firsts’ that Fujifilm is touting for the new model; it’s also going to be the first mirrorless digital camera to boast a 43.8mm x 32.9mm sensor that supports 4K 30p video recording, and it’s the first medium format mirrorless digital camera to have a sensor that is equipped with phase detection autofocus pixels across its entirety. It’s powered by the X Processor 4 engine which should provide the vivid colour reproduction Fujifilm’s cameras are noted for. Like the GFX-50s, it also maintains a fairly slim profile for such a comprehensively equipped camera, with Fuji claiming it’ll be about the same size and weight as a high-end DSLR, despite packing a sensor that’s 1.7-times the size of a 35mm full-frame sensor. It has launched alongside the smaller GFX 50R – a slimmed-down version of the original GFX 50S. The camera will go on sale in early 2019 for an expected price of $10,000 before tax.